The word on the street is that we need to drink eight to ten eight-ounce glasses of water (8×8) every day to keep hydrated and healthy. The word on the street is wrong. Even mild dehydration will slow down one’s metabolism as much as 30 percent. Preliminary research indicates that eight to ten glasses of water a day could significantly ease back and joint pain for up to 80 percent of sufferers. A mere 2 percent drop in body water can trigger fuzzy short-term memory, trouble with basic math, and difficulty focusing on the computer screen or on a printed page. Drinking five glasses of water daily decreases the risk of colon cancer by 45 percent, plus it can slash the risk of breast cancer by 79 percent, and one is 50 percent less likely to develop bladder cancer. The myth has been repeatedly debunked by doctors and scientists. Even Snopes has declared it false. Eight to Ten Eight-Ounce Glasses? Here’s how the eight to ten glasses myth got started. A study in 1945 found that people need about 2.5 liters of water a day. Overall. But it went on to say, “Most of this quantity is contained in prepared foods.” The 2.5 liters was simplistically translated into eight to ten eight-ounce glasses of water, and the clarifying sentence was ignored. We get our water from many sources. Food provides 20–28 percent of total water intake. Watermelon, strawberries, lettuce, celery, and spinach are 90–99 percent water; yogurt, apples, pears, oranges, carrots, and cooked broccoli are 80–89 percent water. Bananas, avocados, baked potatoes, and cottage and ricotta cheese are 70–79 percent water. Pasta, beans, peas, fish, chicken breasts, and ice cream are 60–69 percent water. Bread, bagels, and cheddar cheese are 30–30 percent water. 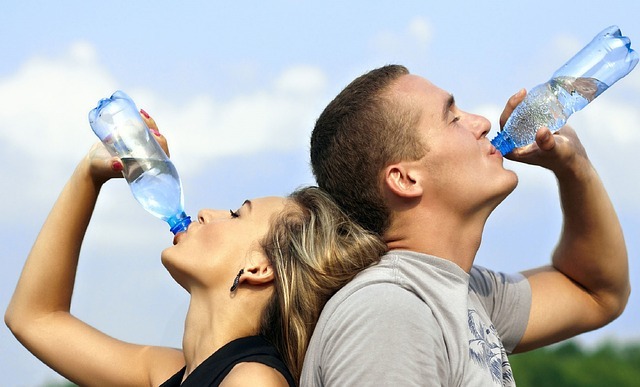 Beverages other than water provide around 44 percent of our water intake. Beverages are composed mostly of water—even beer and wine. Fruit juices are mostly water. Sodas are mostly water. Tea and coffee are mostly water. Some people warn that caffeine is a diuretic that can remove water from the body, but it does not have that effect in people who drink it regularly. Two-Thirds body Weight in Ounces? I’m not sure where the rule about two-thirds body weight in ounces came from, but a doctor named Fereydoon Batmanghelidj did recommend drinking half your body weight in ounces. He just made that up. He was a crank who believed dehydration is the main cause of disease. He promoted his Water Cure, which was not based on any scientific evidence. His story is an interesting one; it’s a cautionary tale about how an intelligent, educated man deceived himself. I wrote about him for Science-Based Medicine. I’m guessing some people gullibly accepted his non–evidence-based recommendation of half your body weight and arbitrarily raised it to two-thirds to allow for extra water losses with activity. If you become mildly dehydrated, you may experience symptoms of thirst, dry mouth, decreased urination, darker urine, headache, or muscle cramps. Thirst will usually get you to drink more, thus solving the problem. Over-hydration can be dangerous. In the early stages, it can cause nausea and vomiting, headache, confusion, and disorientation. If not treated, it can cause muscle weakness, cramps, seizures, and coma. People have died from water intoxication, notably Jennifer Strange, a California mother of three who drank 7.5 liters of water in a radio contest to win a video game system. She came in second in the contest, went home, and promptly collapsed and died. Several radio employees were fired, the station was eventually shut down, and a jury awarded her survivors over $16 million in damages. A study of runners in the 2002 Boston marathon found that almost 2,000 participants had some degree of hyponatremia (low blood sodium levels due to over-hydration) and ninety had critically low levels. These runners gained weight (water weight) during the race. Runners believed mild dehydration would impair their performance, but studies have shown that dehydration of up to 3 percent does not affect performance. That’s all you need to know. Simple.